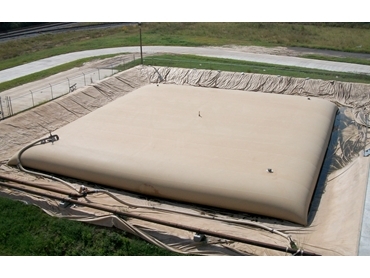 Two jumbo sized pillow tanks have been added to the range by Flexitank , with capacities of 950,000 litres (250,000 gallons) and 1,900,00 litres (500,000 gallons). Gavin Hodgins, Flexitank Australia’s Operations Manager, states the jumbo sized pillow tanks have been fielding requests for the past few years. It was thanks to recent demands, from the Middle East and Asia, there was enough capacity to manufacture these jumbo sized pillow tanks. Flexitank Australia’s pillow tanks are used in various industries from mining, construction, pool renovation and tank renovation, aid agencies, military and government sectors. Standard pillow tank sizes range from 1,200 litres (317 gallons) up to the jumbo pillow tank size of 1,900,000 litres (500,000 gallons). Materials ranging from basic PVC through to military bulletproof polyurethanes . High frequency, hot air and hot wedge welding techniques. Quality fittings 12mm (½”) through to 200mm (6”) tailored to suit customers’ application. Can be used for water tanks and fuel tanks. Can also be used for short and long-term storage of potable food grad products, including wines and olive oils. No product degradation inside the pillow tank. Can be used for commercial or recreational use. Standard tanks are available for immediate worldwide shipping and can be made to order.